The challenges for Manuka Roofing were to work around the actual on-site building alterations as they progressed and they worked closely with the builder synchronising works with the roof lantern and the renewal of the existing tiled roof to blend the new roof with the old. Jamie adds: “The weather was kind to us (mostly) even though the area is pretty rural and exposed. By using the mechanically fixed system meant our reliance on good weather for progress wasn’t required, which is a key benefit of the Sarnafil single ply membrane system over other systems which are dependent on having good, dry weather for installation”. Installation took Jamie and his team seven days in total which included complex detailing around upstands, rooflight and gutter runs. Jason said: “Progress was amazingly swift as we worked towards getting the house weathertight. 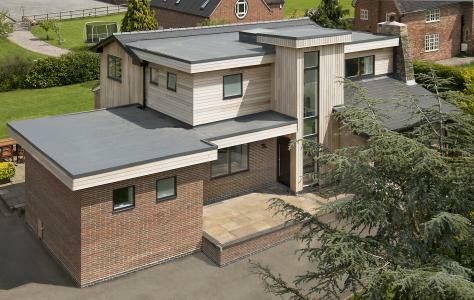 It’s important to get flat roofs right – particularly in our situation where there’s roughly 120m2 of it to go wrong!”. Peter Manning, Sika Ltd, Marketing Manager, Roofing said: “It’s a great endorsement for the Roof Assured by Sarnafil brand to have someone as influential as Jason Orme to specify the Sarnafil membrane for his own personal renovation project. His blog about the installation demonstrates why the Sarnafil single ply membrane was the best solution for this quite complex project. It also gives credit to the quality of the Manuka Roofing installation”.